Excel Tip: Searching and Highlighting - Something New Everyday! Many of us use spreadsheets to manage huge lists of data, like customer data bases, salesperson data bases etc. Today we will learn a little conditional formatting trick that you can use to search a worksheet full of data and highlight the matching cells. First identify which cell you want to use as search bar. Lets say we choose F4. Now, Select the data cells you want to search and go to conditional formatting. But there is a problem with this, it returns true when the search bar is empty, and thus you end up highlighting all cells. 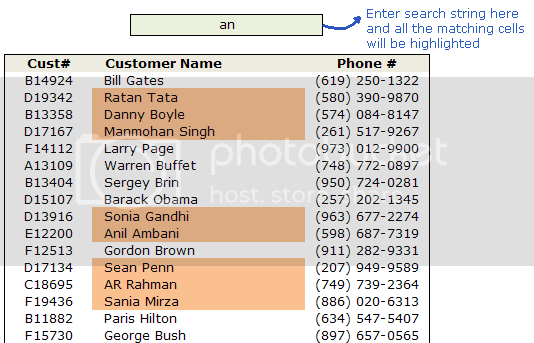 So we add a further condition that will highlight the matched cells only if the search bar contains some data. Finally set the formatting you want to use. I choose dull orange color. You can choose blue, green or pink too. Hit ok and you are good to go.